DownWithTyranny! 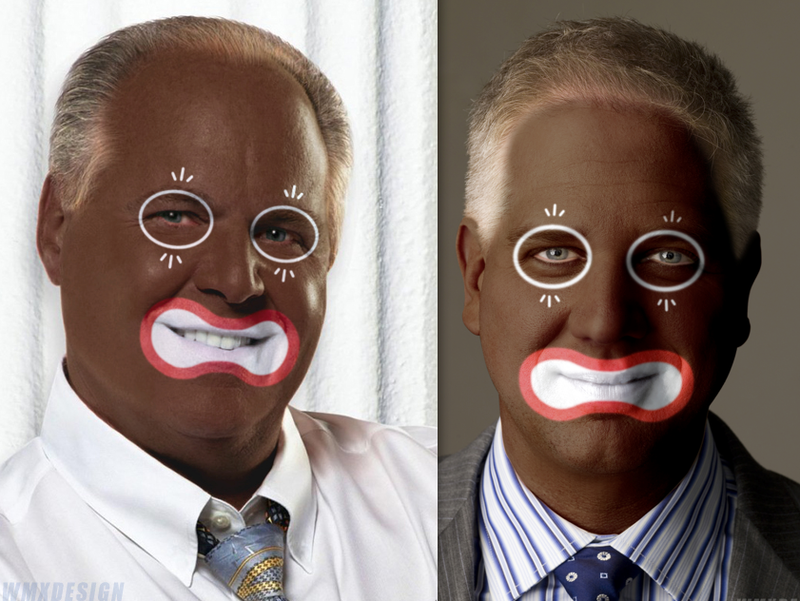 : Are The Teabaggers Racist? Yesterday the NAACP condemned the teabaggers' "explicitly racist behavior," while Glenn Beck, their spiritual leader, amped up his campaign to trivialize and denigrate both Abraham Lincoln and Martin Luther King by holding a racist rally in Washington on August 28, the anniversary of King's historic "I Have a Dream" speech. 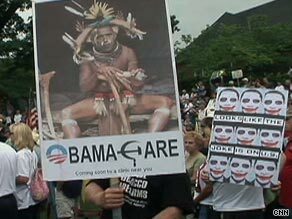 The resolution, which was submitted by the NAACP's Kansas City branch points out that teabaggers have "displayed signs and posters intended to degrade people of color generally and President Barack Obama specifically" and calls "the racist elements" within the tea party "a threat to progress." It calls on "the leadership and members of the tea party to recognize the historic and present racist factions within it and to repudiate those factions." Good luck with that. As anyone who's every attended a teabagger event well knows, divisiveness in general and racism in particular are the very organizing principles around the "movement." They can't very well go out and try to gin all that faux grassroots populism based on bigger bonuses for insurance company CEOs. At the teabagger rally I went to in Alhambra, the "anchor baby" theme was far more dominant than ever "read the bill." For far too long white Americans have been told that diversity is something beneficial to their existence. Statistics prove that the opposite is true. New Hampshire residents must seek to preserve their racial identity if we want future generations to have to possibility to live in such a great state. Affirmative action, illegal and legal non-white immigration, anti-white public school systems, and an anti-white media have done much damage to the United States of America and especially New Hampshire. It is time for white people in New Hampshire and across the country to take a stand. We are only 8 percent of the world's population and we need our own homeland, just like any other non-white group of people deserve their own homeland. Like the teabaggers you see on TV, Murdough vociferously denies being a racist. Really. Limbaugh and Beck do too. So does the Republican Party in general. And their nutroots. Sarah Palin was tweeting furiously. And on her Facebook page she wrote, self-righteously, "I am saddened by the NAACP’s claim that patriotic Americans who stand up for the United States of America’s Constitutional rights are somehow “racists.” The charge that Tea Party Americans judge people by the color of their skin is false, appalling, and is a regressive and diversionary tactic to change the subject at hand. "President Reagan called America’s past racism 'a legacy of evil' against which we have seen the long struggle of minority citizens for equal rights. He condemned any sort of racism, as all good and decent people do today. He also called it a 'point of pride for all Americans' that as a nation, we have successfully struggled to overcome this evil. Reagan rightly declared that 'there is no room for racism, anti-Semitism, or other forms of ethnic and racial hatred in this country,' and he warned that we must never go back to the racism of our past." I guess the GOP shock troops at the teabagger rally in the photo to the right missed that speech. Or maybe they don't consider that racism. Glenn Beck and Rush Limbaugh don't. Take CNN's Eric Erickson, for example. He's a GOP polemicist embedded with CNN and he had some advice for his party leaders yesterday that was reported to a mainstream audience by Media Matters. He feels the path to a GOP victory in November is scaring people about how the Black Panthers want to kill white children. "The Democrats will scream racism," he wrote. "Let them. Republicans are not going to pick up significant black support anyway." Had Horton been white, the Republicans still would have used the ad. But Horton was black and the ad was powerfully effective-- so effective that it and Dukakis's stupid answer about opposing the death penalty even if his wife were murdered destroyed the Democrats in 1988-- the Democrats screamed racism at the top of their lungs and their accomplices in the media have forever agreed. Willie Horton = racism. Nonsense. The ad worked. It was powerful. It was the truth. That's why the Democrats screamed racism so loud. It was the only way to stop the GOP from going this direction again. They know the GOP lives in perpetual quixotic quest for the day it gets a significant share of the black vote. Now we have King Samir Shabazz. He showed up at a polling location in Pennsylvania and intimidated voters going into the polls. The Justice Department pursued the case and, having received a verdict it the government's favor, Obama's Attorney General Eric Holder stopped pursuing the New Black Panthers. Video has subsequently come out of King Samir Shabazz encouraging the murder of white children. Republican candidates nationwide should seize on this issue. The Democrats are giving a pass to radicals who advocate killing white kids in the name of racial justice and who try to block voters from the polls. No racism there, of course. And speaking of sociopathic right-wing racism, yesterday the House was back from vacation and one of the first bills to pass, HR 4514, Colonel Charles Young Home Study Act passed with an overwhelming bipartisan majority, 350-26. All 225 Democrats voted yes, as did 125 Republicans. The 26 NO votes were from 26 right-wing, racist Republicans, including, notably, notorious and rabid haters like Paul Broun (R-GA), John Campbell (R-CA), John Culberson (R-TX), Virginia Foxx (R-VA), Louie Gohmert (R-TX), Darrell Issa (R-CA), Steve King (R-IA), Jack Kingston (R-GA), Doug Lamborn (R-CO), Randy Neugebauer (R-TX), and Paul Ryan (R-WI). The entire GOP leadership voted YES, even Boehner and Cantor (although the leader racist in the leadership, Mike Pence, didn't vote at all. The bill directs the Secretary of the Interior to conduct a special resource study of the Colonel Charles Young Home, a National Historic Landmark in Xenia, Ohio, to determine the suitability and feasibility of designating the Home as a unit of the National Park System. (Colonel Charles Young was a distinguished African-American officer in the U.S. Army, a pioneer of techniques in military intelligence, as well as a commander of troops in combat in the Spanish-American War and the Mexican expedition against Pancho Villa.) Even Mean Jean Schmidt signed on as a co-sponsor. We'll just leave it at that. When I was reading Ryan Murdough's speech I kept hearing Eminem's "White America" going through my head. What a gruesome twosome your graphic portrays. Well done and funny, too. I find it interesting how Teabaggers Inc. responded to the resolution. The NAACP gave the corporate PR people and lobbyists behind the teabagger movement a chance to move away from the racism and move towards the mainstream. Instead, they chose to amp up the racism. They know the history of using racism to keep middle class and poor whites from realizing that they have much more in common with people of color in this country than with the wealthy elites. If I might make an observation from a foreign perspective I’d say that you need to stop with the ‘Teabagger’ line. It was a crap joke at first and it has been wearing thin ever since. It makes those that oppose the Tea Party movement sound juvenile and pathetic. This ongoing ‘joke’ has been widely reported abroad and many people that might have held sympathy for liberal America think you credibility is taking a hit every time you use it or seem to oppose, mock or stifle the free association of people to meet and promote whatever political agenda they so please within the bounds of the law. On the subject of this ‘letter’ of course it was racist and the responsible parties have been excommunicated as it were. There are idiots on both sides. Do not demean yourselves by inferring these views are representative. Anybody who uses the word "teabagger" are themselves racist. Wow, the stupid spread the same crap everywhere on the net. To the foreigner worried about the perception of democrats who use the word teabagger: IT IS THE PERFECT NAME. The baggers picked it for themselves BUT THEY DIDN'T KNOW WHAT IT MEANT. So they had to try to ditch it. Everything the baggers want or propose it the product of the same ignorance: it is the perfect name. Except for the racism, of course. They know what that means- and as the dregs of the John Birch society they also know that non-whites and communists are the existential threat to America.